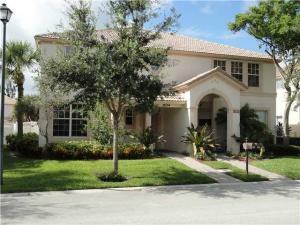 Gables Montecito is a premier apartment and townhome community in Palm beach Gardens. These 194 units feature one to four bedroom spacious floor plans. All of these homes have either an attached or detached garage, covered porches, lavish lanais, hurricane shutters and are pet friendly. Homes at Gables Montecito have incredible designer finishes and open floor plans. These finishes include custom cabinets, nine to ten foot soaring ceilings, custom tiling, natural stone bathroom floors, stunning foyer entrances, generous walk in closets and open kitchens with islands. Relaxing is easy along the 12 acre lake with picnic areas or in one of two resort style heated pools. There is also a fitness center, kids play room and sports courts. The homeowners association includes cable, security monitoring, pest control, lawn maintenance and a nighttime manned gate for peace of mind. Palm Beach Gardens is the perfect place to cater to all shopping, dining and beach chilling needs. Palm Beachs gorgeous beaches are just a short drive away where many watersports activities like paddleboarding, snorkeling and supreme fishing take place. The shopping in Palm Beach Gardens is unparalleled with its fabulous Gardens Mall, Downtown at the Gardens, and Legacy place where you will find everything from Chanel to Pet Smart. The Palm Beach International Airport is also a short 20 minute drive away as well as City Place in West Palm Beach. Gables Montecito is a tropical paradise where you can enjoy all the pleasure of Floridas stunning beauty and ecosystem. Information in regards to Palm Beach Gardens real estate and Montecito homes for sale or other listings may have come from a cooperateive data exchange service. All rights reserved. Information deemed to be reliable but not guaranteed. The data relating to real estate for sale on this website comes in part from a cooperative data exchange program of the multiple listing service (MLS) in which this real estate firm (Broker) participates. Listing broker has attempted to offer accurate data, but buyers are advised to confirm all items. We provide all information about Palm Beach Gardens homes for sale and Montecito real estate or other listings as is with absolutely no warranties. This site will be monitored for 'scraping' and any use of search facilities of data on the site other than by a consumer looking to purchase real estate, is prohibited. Feel free to contact our agents to find a great Montecito Palm Beach Gardens specialist. Montecito in Palm Beach Gardens is really a wonderful location. The Palm Beach Gardens location is amazing. But, if this isn't the community for you, you might like one of the other local communities like Residences At Midtown or Shady Lakes or Pirates Cove that are located here as well.